On December 7th, 1941 Cornelia Fort, a young civilian flight instructor from Tennessee, and her regular Sunday-morning student took off from John Rodgers Airport in Honolulu. Fort's apprentice was advanced enough to fly regular take-offs and landings and this was to have been his last lesson before going solo. With the novice at the controls, Fort noticed a military aircraft approaching from the sea. At first that didn't strike her as unusual; Army planes were a common sight in the skies above Hawaii. But at the last moment, she realized this aircraft was different and that it had set itself on a collision course with her plane. She wrenched the controls from her student's grasp and managed to pull the plane up just in time to avoid a mid-air crash. As she looked around she saw the red sun symbol on the wings of the disappearing plane and in the distance, probably not more than a quarter mile away, billowing smoke was rising over Pearl Harbor. The disbelieving Fort had just unwittingly witnessed the U.S. entry into World War II. A little more than a year after this near miss, Fort would be flying military aircraft for the U.S. and a mid-air collision would tragically make her the first American woman to die on active military duty. That Fort should one day put on a flight suit, live in army barracks and fly some of the largest and fastest military aircraft of the day, would probably have raised more than a few eyebrows in the genteel circles in which she was raised. Dr. Rufus Fort and his wife Louise had brought up their oldest daughter to be the demure wife of a Southern gentleman. Their five children grew up in an opulent 24-room house originally built in 1815. It stood on 365 acres of land along the Cumberland River in Davidson County, Tennessee. A chauffeur drove the children to their exclusive private schools. And after Cornelia turned 19 her father presented her to society in an elaborate debutante ball, attended by hundreds. Around the time Dr. Fort died in the spring of 1940, Fort took her first flying lesson. She was instantly addicted. Though she could never quite articulate why she loved planes so much, her sister would later claim that it was quite simple: Cornelia was, Louise observed "a great rebel of her time." Within a year Cornelia had become the first female flight instructor in Nashville. After President Franklin D. Roosevelt established the Civilian Pilots Training Program, she took a flight instructor's job at Fort Collins, Colorado. Then in the fall of 1941, she was hired to teach defense workers, soldiers and sailors to fly in Hawaii. In a letter home to her mother she wrote: "If I leave here I will leave the best job that I can have (unless the national emergency creates a still better one), a very pleasant atmosphere, a good salary, but far the best of all are the planes I fly. Big and fast and better suited for advanced flying." In fact, the national emergency created by America's entry into the war did temporarily create better opportunities for Fort and many other U.S. women pilots. 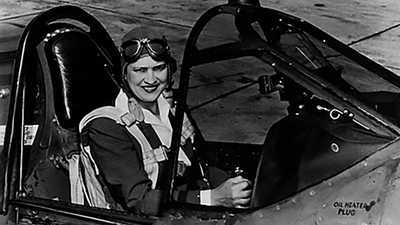 The first invitation came in a telegram dated January 24, 1942 from leading female aviator Jackie Cochran. It asked Fort to join a select group of American women who would fly with the Royal Air Force Air Transport Auxiliary in Britain. Fort couldn't accept the offer because she wasn't back in the continental U.S. in time, but in the fall of 1942 she was one of a handful of women to receive another invitation. This time the telegram asked her, "if interested, to report within twenty-four hours to Wilmington, Delaware, for service in the Ferrying Division of the Air Transport Command." Fort was more than interested, she was ecstatic. Here was a chance to play an important role in the war effort. In a letter home she wrote, "the heavens have opened up and rained blessings on me. The army has decided to let women ferry ships and I'm going to be one of them." The female pilots in the newly established squadron, the Women's Auxiliary Ferrying Service, or WAFs as they were known, were hired to fly planes from factories to military air bases. Their services freed up male pilots for combat missions. Fort frequently found herself flying in open cockpits in freezing weather without a radio. On these ferrying missions during the war, the women often had to navigate by comparing maps with landmarks they could see below them. The job was made even more difficult because some of the planes, though tested, had never been flown before, and many of the air bases were camouflaged. In poor weather conditions a cross-country trip could sometimes take several days. At the end of a mission, Fort would hitch rides back on whatever form of transportation was available, sometimes it was a train sometimes another plane. From the very beginning, Fort and the other women in the squad were the focus of hostility from their male counterparts. "Any girl who has flown at all," she once wrote, "grows used to the prejudice of most men pilots who will trot out any number of reasons why women can't possibly be good pilots... The only way to show the disbelievers, the snickering hanger pilots," she concluded, "is to show them." The women did just that. They were resilient, professional, and as capable as the men of flying any military aircraft they were asked to. They called in sick less frequently and they maintained a marginally better safety record. Fort flew for her country for just a few brief months. On March 21, 1943, she was one of a number of pilots, both male and female, who had been assigned to ferry BT-13s to Love Field in Dallas Texas. During the course of that mission, one of the men's landing gear clipped Fort's airplane, sending it plummeting to earth. Fort didn't have time to parachute to safety. 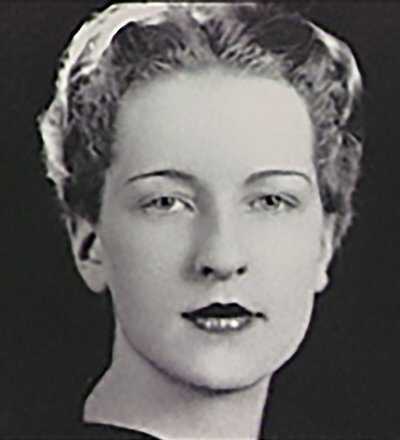 Her commanding officer, sent a compassionate letter back to the young pilot's mother: "My feeling about the loss of Cornelia," wrote Nancy Love, "is hard to put into words -- I can only say that I miss her terribly, and loved her...If there can be any comforting thought, it is that she died as she wanted to -- in an Army airplane, and in the service of her country." Despite the words of sympathy, Fort and the other 37 female pilots who died flying military planes during the war, received no military recognition. The army didn't even pay for their burial expenses because the women were considered civilians. Fort's achievements as a military pilot are commemorated by an airpark named after her that was built in 1945 near her family farm. Her own words on an historical marker at the site simply and modestly sum up her wartime contribution: "I am grateful" she wrote, "that my one talent, flying, was useful to my country." The triumphant former beautician won the cross-country race, completing the 2,042 miles from Los Angeles to Cleveland in record time. 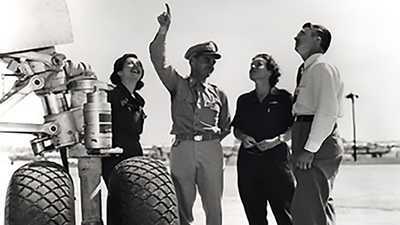 To demonstrate the safety of the B-29, Colonel Tibbets recruited women demo pilots. 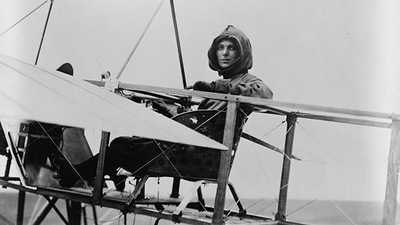 Harriet Quimby was the first American woman to become a licensed pilot, and went on to fly across the English Channel.